The Pluris Valuation Advisors TARP participant overview has been compiled through searches of public filings as of July 1, 2009. In total, this Pluris survey analyzed 265 TARP (Troubled Asset Relief Program) participants who have received in excess of $193 billion of funding. In exchange for the funds received, the participants have issued preferred stock and warrants to the U.S. Treasury. The primary purpose of the overview is to analyze the fair market value of warrants issued by participating banks. These fair market values are estimates of the prices these illiquid securities might fetch if auctioned by the Treasury (and should act as a guide to the values realistically achievable when banks repurchase warrants under the program). The analysis examines warrant values (as well as discounts from their theoretical “Black-Scholes” values) based on bank total assets, and geographic location. 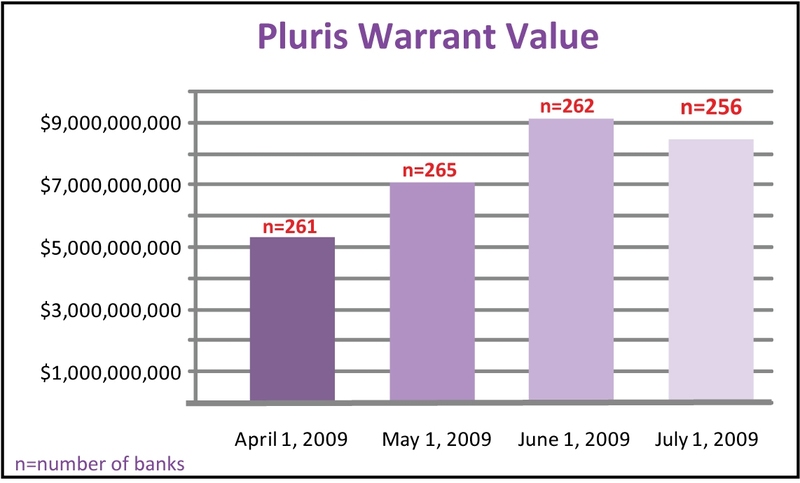 For an overview of Pluris' TARP Warrant capabilities, and our research on illiquid warrants, download the survey now.